You will not enjoy your food, You can’t enjoy foods without doubling your food budget, Being vegan is hard, etc. Too often in today’s society we take the easy way out and listen to what commercials and magazines force feed us without learning the real truth. Instead, we should educate ourselves with the correct knowledge and resources. Veganism is probably one of the most misunderstood concepts in dieting, but this book will educate you about the real truths. You will learn that all of these ideas, and more, are wrong. Being vegan is not only a more healthy way of living, but can be easy as well. If you’ve ever considered veganism, but thought it was too hard or expensive - pick up Easy to be Vegan and start changing your mind, and life, today. Tags: Vegan diet, vegan lifestyle, veganism, vegan, plant based diet, plant based, healthy lifestyle, health, healthy diet, healthy vegan, easy, vegan recipes, vegan bodybuilding. Having had no trouble with the transition when I switched to a whole foods vegan diet, I can't see I gained any real personal value from this book, though I do really enjoy it and appreciate that it was written. I know of numerous individuals who struggle to adjust to the vegan lifestyle and end up giving up before they've ever really begun. I think this book would help them see light and maybe enjoy working through the challenges of their new life change. After all, exploring the new varieties of plant foods and combinations is supposed to be fun and exciting! 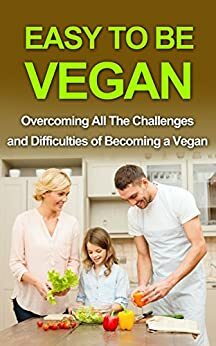 I think not only for those new to the lifestyle, but also for friends and family that would like to better understand veganism, this is a good read. I've faced all the questions, and judgements, and concerns, so I know that they are bound to arise at some point, and I found that many of the people asking just didn't grasp a strong enough understanding of what veganism is and how one may go about pursuing it. I actually purchased this book with the intention of sharing it with a family member who was recently prescribed to vegan diet and has massive hesitations. This individual understands the theory and the health benefits but is afraid to give up what they know. I'm fairly confident after reviewing the book myself, that this is a good piece of material to help ease their transition and make them excited about food again. *I received this product at a discounted rate in exchange for my honest review. My opinions are 100% my own, and not in any way influenced by the seller or manufacturer. This is really just basic information on veganism. I'm not a fan of the faux meats mentioned. If it comes out of a box and looks like chicken but isn't, then it's way too processed for my taste. We, whether vegan or not, should be concentrating on whole foods and not processed ones. I decided to go Vegan about 3 months ago but it was hard for me to plan everything I had to buy, didnt know what to cook and i was missing the tasty food I was once accustomed to eat. This book was a revolution for me! It made understand that vegan life is not so hard as i thought, you just need a good introduction to the matter and it gets a lot easier. now i don't feel ant effort with my grocery list and also, food tastes great! I have been on and off with going vegan over the past few years as I just found it really hard to stick with it. I want to attempt to get back into it but I had some concerns. This book did a nice job of covering all things from social concerns to diet and deficiency issues that all people think about like protein. I found the info helpful in many ways and it helped reassure me that I am making the right choice. I feel more motivated now. I thank the author for a well written book on the subject. My daughter and I are making the change to Vegetarian next week, but we're not big on dairy and eggs, so I figured if I learn more about either one that would be better than just jumping in...the book gave me a lot of info that was both new and confirming what I found surfing the web. Personally, it's been a bit daunting to find the sneaky ways animal products are put on package labels, so I wish I would have found more listed in the book, but otherwise I plan on having my daughter read this too to help give her a better idea of how to help mommy and her enjoy the change...good luck to others researching the change!